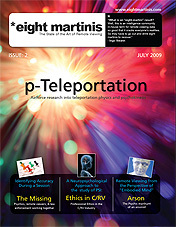 Issue 2 July 2009 - available Now! This issue also comes in a full color printed on demand version. You only pay for a personal copy to be printed (we make no profit) and for it to be delivered to the United States, Canada and the U.K. only. By credit card or paypal.